As it was my turn to arrange the Southern Strategists fortnightly game I thought it about time I inflicted another steampunk game on them. I say inflict because our merry group of gamers are evenly split between the traditionalist, strictly historical types and the more adventurous open minded spirits. I say this tongue in cheek because I fully accept that this style of gaming is not everyone's cup of Darjeeling. My fellow Strategists have been wargaming mates for over 25 years so clearly we have learnt to accept each others little foibles with gentlemanly good grace and not a little grinding of teeth at times. "VOLTAVIA INVADED", Teutonian forces occupy Voltavian Industrial Region. My scenario was based around the ongoing struggle between the Teutonians and the Britainians over the Teutonians unprovoked invasion of the coal and mineral rich principality of Voltavia. As an Ally of the Voltavians the Britanians have no choice but to declare a state of war against the Teutonians in outrage at their naked aggression and illegal occupation of the Voltavian coal mining and industrial region of Anthracillia. This conflagration is showing all the signs of escalating into something much bigger as neither side is prepared to back down despite frantic diplomatic wrangling behind the scenes. Their has already been talk of atrocities being comitted by occupying Teutonian forces but for the moment this appears to be purely conjecture and rumour. The scenario had the Teutonian advance columns racing forward to capture the crossroads and village to secure their route of advance and lines of communication. 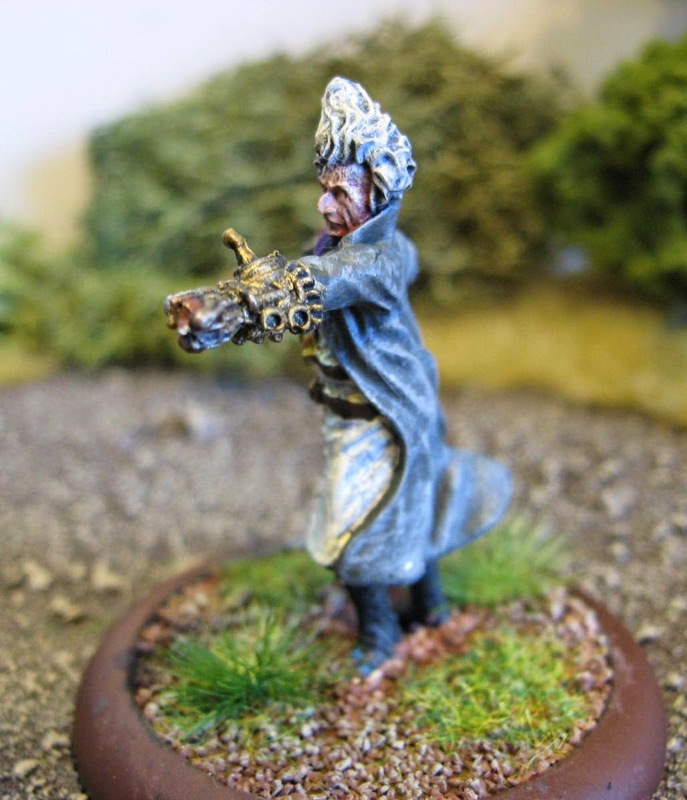 Rules used in the game are FUBAR Vic Sci-fi and figures are a mixture of Black Tree, Foundry, Great War Miniatures, Renegade and Ironclad from our various collections. Please excuse WW1 Germans mixing it with Sudan era Brit Naval Brigade...hey nobody said it had to make sense! The Britainians are pooling every resource at their disposal to halt the Teutonian juggernaut and have thrown up a hasty defensive perimeter around the village as they await reinforcement by any friendlies available within the vicinity of the village. This was a bit of a knocked together game so dont look for finely balanced forces and well thought out terrain as will become readily apparent from my report. From the very beginning both sides suffered miserably form abysmal activation throws. The Brit tanks with the exception of the WW1 female Tank refused to budge and it was rumoured that this may have been caused by Teutonian secret agents tampering with the fuel reserve. Damned unsporting! 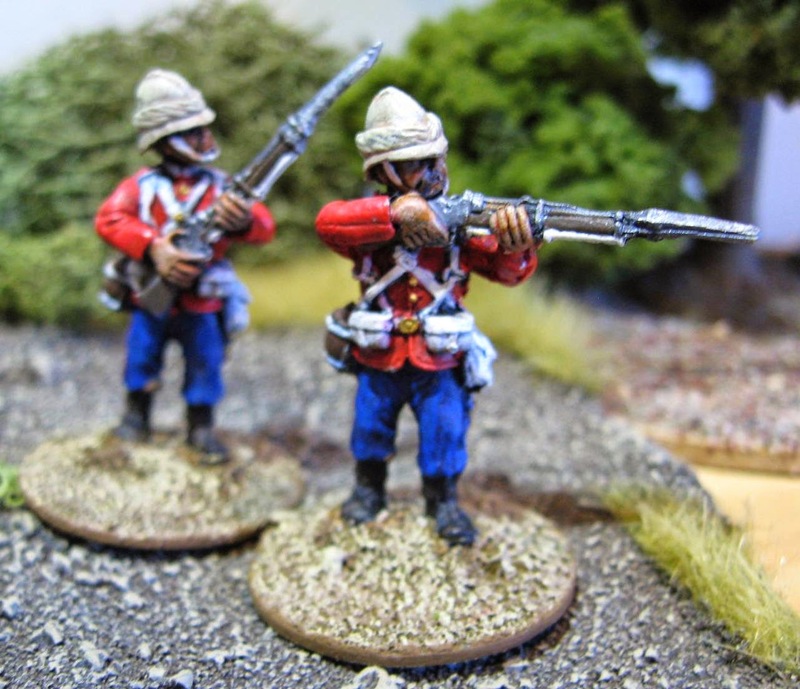 This however didnt explain the extremely tardy advance of most of the British infantry reinforcements. Possibly suffering the after effects of a dodgy batch of Miggins, Field Pie, Mince Mk2 which would account for the foul odours emanating from the Britanian latrines. Fortunately for the Brits the Teutonians werent faring much better as their artillery and tanks refused to advance. The Teutonian infantry on the other hand positively raced forward and were advancing in force on the Britanian left flank. It was at this point that the Brit female heavy tank made an appearance and began pouring a sustained and galling fire on the Teutonian infantry. The Teutonian Jager also came under heavy fire from the Britianian troops located in the village. After draining and refilling the Britanian light tanks fuel tanks a more acceptable rate of progress was adopted and the Brit reinforcements, including a Company of Naval ratings and their supporting Aeroneff cautiously took up position on the Brit right flank next to the cemetery and rag tag bunch of Voltavian Militia and Brit regulars who were frantically throwing up sand bag defences in the centre to hold the crossroads. Her Magesties Scout Aeroneff Goshawk in an aerial support role. The sudden appearance of the strange Britianian Aerial contraption seemed to throw the Teutonians into something of a tizz as every available gun was brought to bear on her. Despite a number of telling hits including a shot clean through her boiler the plucky Aeroneff stood her ground. The Teutonian Armour remained afflicted by an inability to move which left the Britanian heavy tank unrestricted license to deal to the unprotected Teutonian infantry. 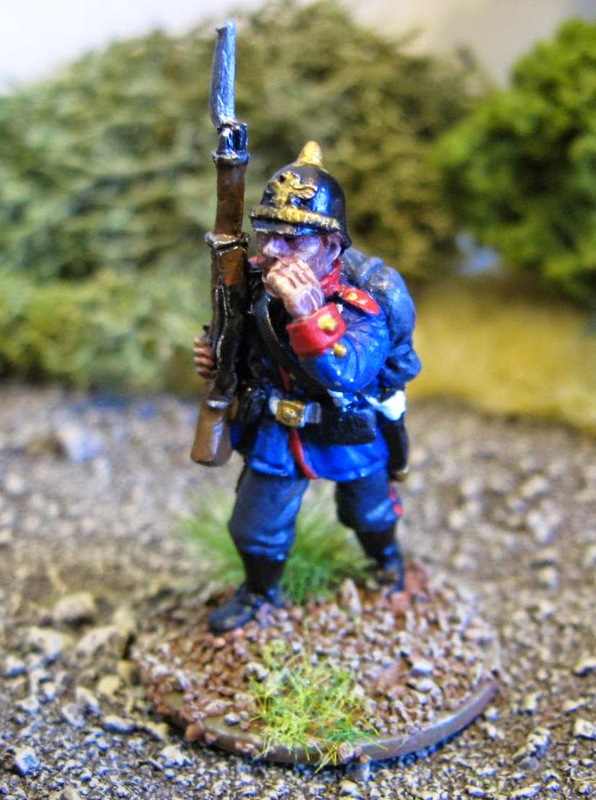 By now the Teutonian grunts were trapped in the crossfire of the tanks MMGs the rifles of the Britanian infantry and an Armstrong Gun that the Brits had managed to bring up on their Left flank. Inexpicably the Teutonians continued raining fire on the Brit Aeroneff rather than getting to grips with the annoying heavy tank. Their continued fire did however pay off as a lucky shot bore straight into the Aeroneffs magazine just as a hail of machine gun fire swept the Brit gunners from the deck. KABOOM!! the the doomed craft fell to earth in a maelstrom of burning fuel and twisted steel plating. It was at this point that the game degenerated into something of a one-sided affair for the Brits as they had firmly ensconsed themselves in the village and were dug in on the cross-roads. The Teutonian infantry had taken appalling losses and were clearly incapable of seizing their objectives. With no hope of pushing forward the Teutonians decided to order a strategic withdrawal. In hindsight this game was poorly thought out by yours truly. The forces were totally wrong for an attack defender game. The Brits probably had at least two too many infantry elements and the heavy tank with its three forward firing MMg's was devastating. The Teutonians would have benfitted by the game being played across the table as well as they would have had room for flanking and would have got their armour and artillery into play much sooner and more effectively. That said I am very happy with the FUBAR rules and I love the look of the thing so sadly for my more conservative fellow gamers you haven't heard the last of the Voltavian Campaign. Jolly good show! A wonderful table and lovely figs...particularly the chap in the last photo! Looking forward to more of the Voltavian Campaign! Impressive looking game. The terrain and troops are superb. Thanks gents, rest assured I shall keep you posted on the Voltavian Crisis as events unfold. Now that looks like fun! Superb, old boy! Yes indeed, quite the most fun one can have and still keep your trousers on. I must say I'm most I'm pressed with your latest contraptions. That lion thingy looks like just the ticket to those bally squareheads a jolly good poke in the eye. A great looking game, even if the attackers had their work cut out for them trying to capture the crossroads. Superb. Thanks Gents, Ive definitely caught the steampunk bug. I like the fact that you can pretty much make it up as you go along so as long as its within a Victorian theme. Slots in nicely with my interest in Colonial gaming as well.